Center Mount 2" Pressure Gauges have easy-to-read two-tone dials printed in bold UV resistant ink for ease of legibility even after extensive exposure to direct sunlight. Every gauge is tested for accuracy and leakage. 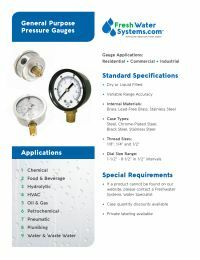 These pressure gauges are designed for demanding applications internationally such as reverse osmosis, oil refining, chemical, food processing plants and water treatment.